*Removal of old UV Cover is charged separately. (or - do it yourself and save some money). We use lifetime thread for all repairs - It never wears out from sun damage. For: Woven Polyester (Dacron Sails) and Laminated Cruising sails. Our Standard wash con- sists of soaking the sails overnight in a diluted solution of water, soap, and bleach. The solutions are all in sufficient levels to clean and treat the sails, but not so much to harm any sail fabrics. After the overnight soak, the sails are "drip dried" for the day, and then hung for the night to dry. • Vacu-Wash - $1.15/ sq. ft.
For: Woven Polyester (Dacron Sails) and Laminated Cruising sails. Modern laminated sail materials are a great innovation in terms of shape holding and weight savings, but they all have one inherent problem. MILDEW! Remove even the toughest sail mildew with our Vacu-WashTM process. The lamination leaves voids between the mylar surfaces and water slowly penetrates these voids by traveling along the fibers between the mylars. This is called the wicking effect. Once the water is inside between the layers of fibers and film, it will remain there and gradually your sails will mildew. Adding to the wicking problem, many parts of a sail, such as uv covers and rein- forcement in the corners, are still being applied by sewing them onto the sail and therefore puncturing the films allowing even more water to enter between the glued surfaces. We have a process that combats this problem. 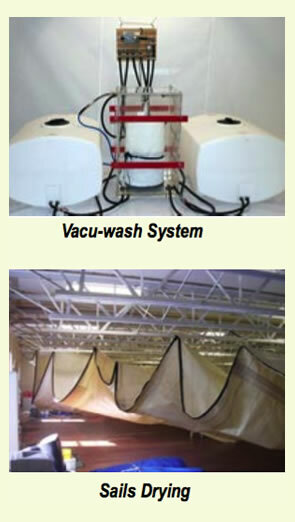 Our Vacu-WashTM process involves placing the sails in a vacuum chamber and removing the air and water from the voids and the slowly introducing a cleaning agent and subsequently a rinse. Once the mildew has been removed and the sail has been dried, we highly recommend that the sail be treated with SailkotePlus to prevent a reoccurrence of this problem. Patio Cushions = Width x Length of seating areaMinimum cleaning fee is $50 regardless of weight or square footage. Please Call 831-646-5346 for your appointment and shipping instructions today. As effective as annual washing is at getting rid of dirt and mildew once it appears, what is really necessary is a preventative solution/process that does not allow mildew to grow. Fight mildew before this happens with SAILKOTETM Plus. 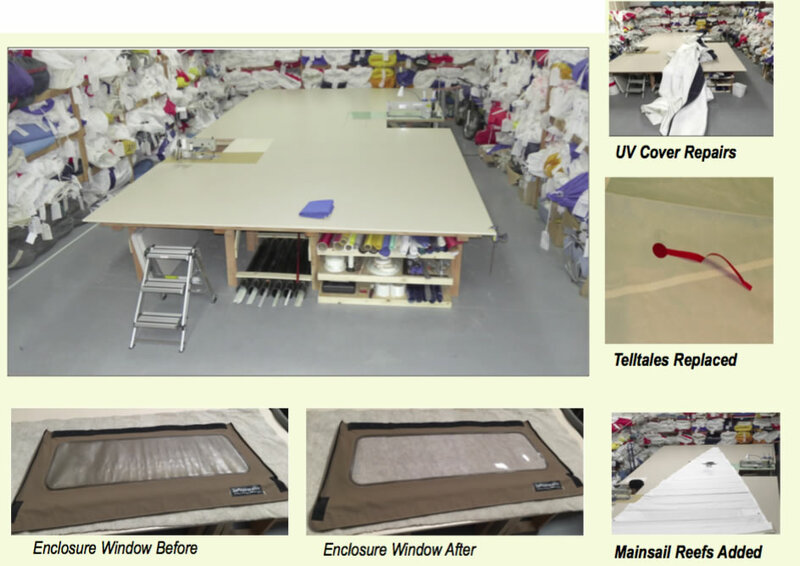 With the advances that have been made in the last ten years in laminated sailcloth and sail handling systems, it would be a shame to not be able to take advantage of these advancing technologies because we could not get a foot hold on mildew growth. We have now developed a technology that attacks and resists mildew at the growth stages. Over the past few years, there have been a few topical solutions that have proven to be either ineffective or had a very short effective life span or both. SAILKOTETM Plus is specially formulated with Dupont Krytox®, an easily applied environ- mentally friendly translucent liquid lubricant specifically designed for marine use. It is a derivative of McLube, with an anti-mildew additive that fights mildew before it starts. It dries quickly to a hard, smooth, ultra-slick, hydrophobic dry coating that bonds tenaciously to almost any surface. And because SAILKOTETM Plus is a dry lubricant, it will not attract dirt or contaminants and will not transfer to other surfaces. SAILKOTETM Plus will severely limit, if not ELMINATE, the growth of mildew on your sails and, depending on use, need not be re-applied any sooner than every 4-5 years.